The first sugar plantations in Hawaii formed in the 1830’s, and at their peak 100 years later, were producing more than one million tons of sugar a year and employing more than 50,000 workers. Expansion of Hawaiian sugar plantations occurred in large part because of the increased demand for sugar in the mainland United States. The “Great Mahele” of 1848 (a land distribution act that allowed foreigners to own land in Hawaii for the first time), American settlement of California, and the California Gold Rush of 1848, all converged to spawn lucrative channels of trade in the Pacific. A little more than a decade later, Louisiana’s sugar production came to a screeching halt due to the Civil War. Without having to compete with Louisiana sugar, Hawaii was able to sell more sugar to California at inflated prices. 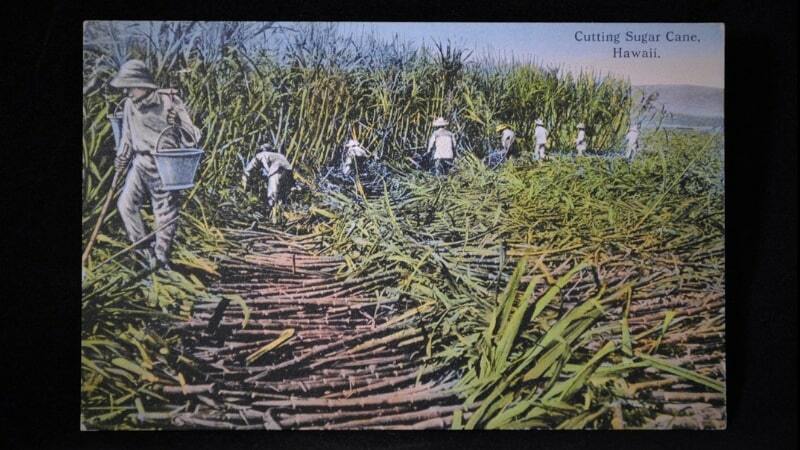 An old Hawaiian postcard depicting laborers harvesting sugar cane. The biggest boom in plantations occurred from 1875 to 1880. The boom was brought on by the signing of the Hawaii Reciprocity Treaty with the United States. The treaty eliminated tariffs on Hawaiian sugar and other products. In return, the United States received land that would later become the Pearl Harbor Naval Base. The impact of the treaty on sugar production was felt immediately. In five years, from 1875 to 1880, Hawaii went from having 20 sugar plantations to 63. When the demand for Hawaiian sugar exploded around 1850, so did the need for an expanded labor force. Plantation owners quickly turned to the practice of importing workers. Growing exceedingly powerful and influential, plantation owners lobbied for; and won the eventual passage of, The Masters and Servants Act of 1850. The new law legalized indentured service, the contract-labor system, and the importation of foreign workers. The law also outlawed labor unions and worker strikes. With the new law enacted, and rising labor demand, workers started emigrating from other countries in large droves, starting with the Chinese in 1852. Other ethnic groups would follow, including the Japanese, Koreans, Filipinos, Portuguese, Spaniards, and even Russians and Norwegians. 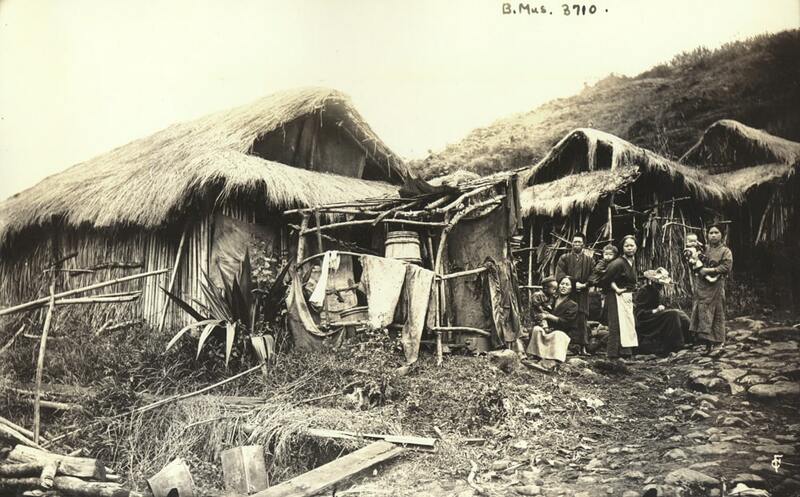 Sugar plantation worker’s home in Wainaku, Hawaii. ca. 1890. Image courtesy of Biship Museum Archives, Honolulu, Hawaii. Photograph by Charles Furneaux. Call Number: SP 3710 Location: E.C. Japanese. Domestic Life. The rapid globalization of the Hawaiian sugar workforce gave birth to a new form of language, commonly referred to as “Pidgin” – a hybrid of Hawaiian, English, Chinese, Japanese, and Portuguese. Still widely spoken throughout Hawaii, Pidgin facilitated effective communication among plantation workers of different ethnicity. The contract-labor system helped plantations recruit new workers; but once employed, workers often rebelled over food provisions, working conditions, and wages. The growing number of migrant workers presented plantation leaders with another big problem; their laborers came from many different countries, spoke vastly different languages, and had names that were hard to spell and even more difficult to pronounce. To better manage their workforce, plantation managers devised new ways to track laborers and secure their obedience. 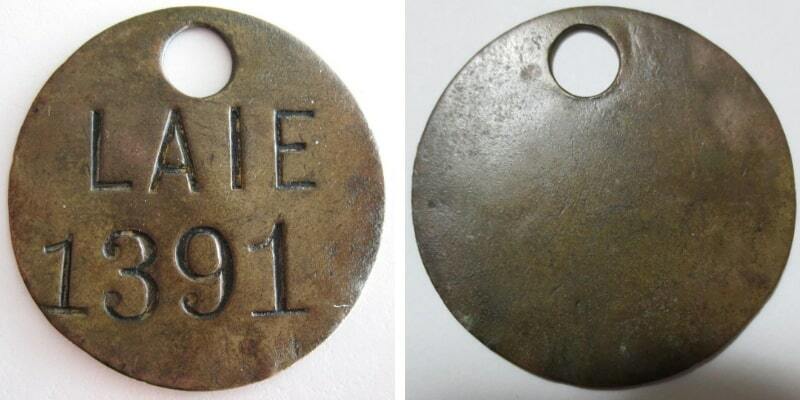 One such method, introduced in the 1890s, was the ‘bango’―a Japanese word for an ID tag. Brass bango with the number “872” stamped on its face. This would have been worn around the neck of laborer. Recovered in Hawaii by Brent and Blake Cousins. As new laborers arrived in Hawaii, an official from the plantation assigned a unique number to each worker as they exited the ship. 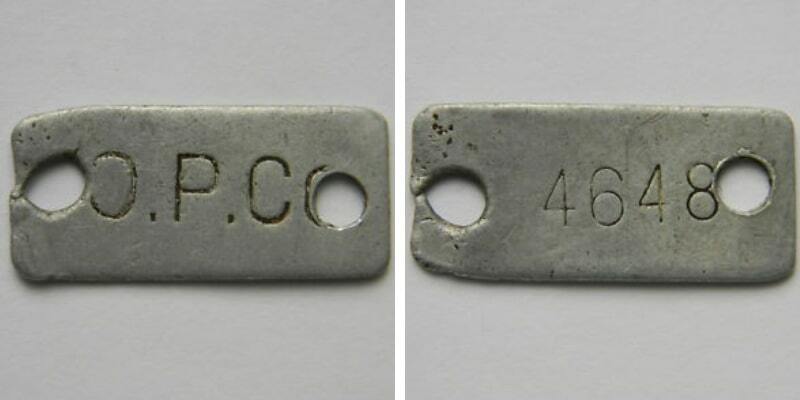 Pronounced “bong-go,” workers were given a tag made by plantation, usually of brass or aluminum, and stamped with their unique ’employee’ number. The tags came in different shapes and sizes. The shape; which varied from a circle, octagon, square, to an oval or triangle, directly corresponded to a worker’s ethnicity. 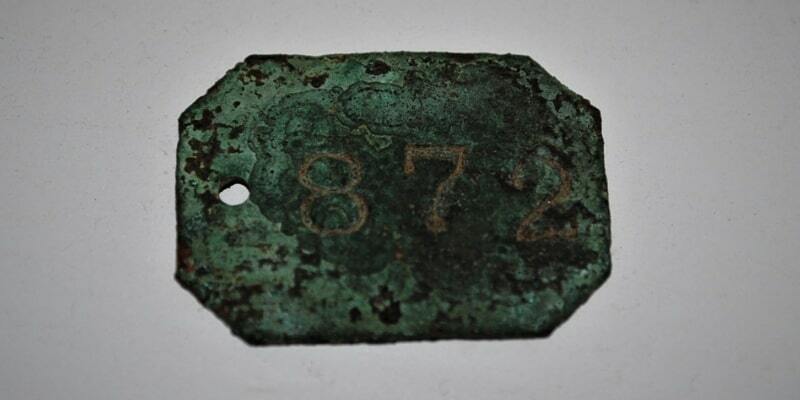 And just like military ‘dog tags,’ ‘bangos’ were worn on chains around the neck. Brass bango with “LAIE 1391” stamped into its face. Laie Sugar Plantation was in business from 1872-1931. Laie is a town next to Kahuku, on the northern part of the island of Oahu. Image courtesy of WorthPoint.com. Eventually, every Hawaiian plantation used the ‘bango’ system. The ‘bango’ was tied to pay, deductions in pay due to infractions, and used to make purchases on plantation-owned properties. Everything from the general store and laundry services to entertainment and medical care, required a ‘bango’ for payment. Even stores not owned by the plantation used the ‘bango’ in extending credit. On payday, employees had to present their ‘bango’ to the plantation’s payroll clerk in order to receive their pay. A policy of “no bango, no pay” was strictly enforced. In effect, the ‘bango’ system relegated the working class to a life of indentured servitude. Bango that once belonged to an Oahu Plantation Company laborer. The original hole broke, so another was punched so the tag could be attached to a necklace. Image courtesy of WorthPoint.com. While the ‘bango’ system helped drive efficiencies in the way plantations were managed, the ‘bango’ denigrated those that were required to wear them. 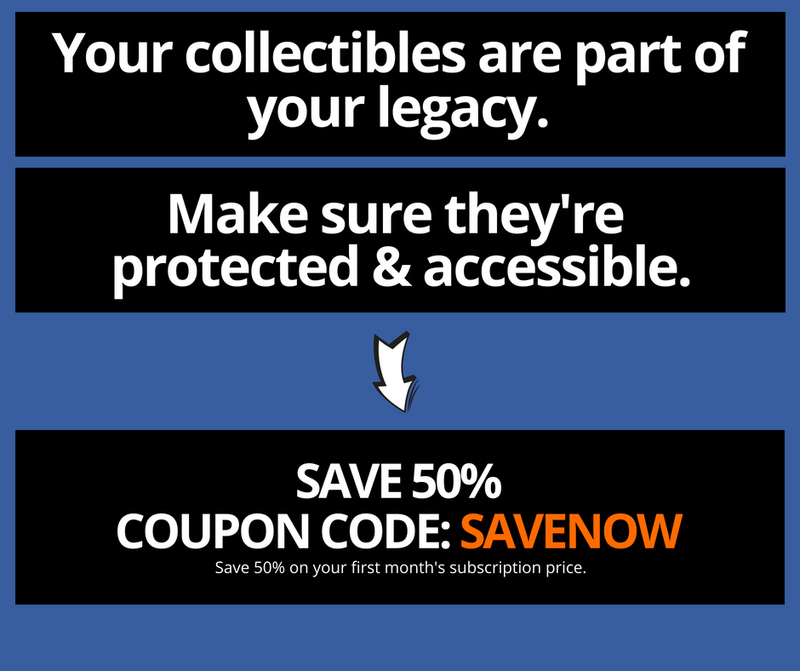 No longer was a person called by their given name, they were merely a number. Intentionally or unintentionally, workers became somewhat of a sub-class, beholden to the whims of plantation leadership. When labor laws began to change in the 1930’s, plantation workers began to organize unions. While this helped Hawaii grow a middle class, it also made its sugar industry less competitive. More liberal trade policies, and the deterioration of trade protections in the decades that followed, slowed demand for Hawaiian sugar. Due to advances in passenger aviation, Hawaii soon experienced a tourism boom. Land and plantation owners soon found they could make more money building hotels than growing cane. Over time, global competition, labor costs, and the tourism trade, killed the sugar industry. By the mid-90’s, most plantations were closed. In 2016, the last sugar mill, located on the island of Maui, harvested its final crop of sugarcane before permanently ceasing operations, bringing a final close to sugar production in Hawaii.